The next task in completing your Annual Training Plan (ATP) is to periodize the season. The accompanying “Period Purpose and Length Table” will help guide you. 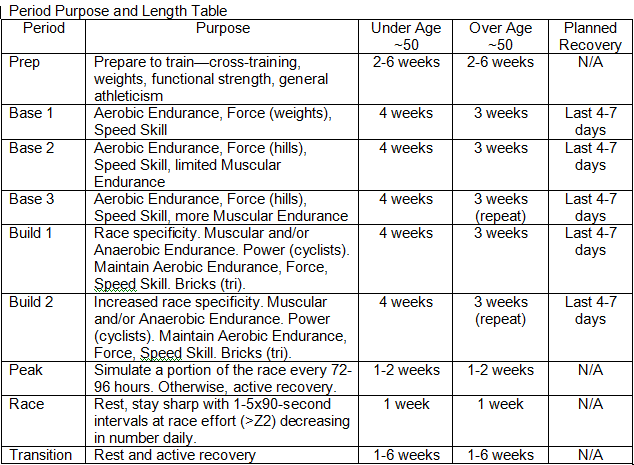 The “Purpose” of each period as described in the table is generally the way it is done by most athletes training for most events. But there may well be differences in the way you train at any given period in the season. For example, when training elite Ironman triathletes I often have them do Anaerobic Endurance training in Base 3 to boost aerobic capacities before starting into the Build period with a heavy emphasis on Muscular Endurance. The only hard and fast rule in periodization is that the closer in time that you get to your A-priority race, the more like the race training must become. “Periodizing the season” means assigning training periods to each week of the year in the “Period” column of your ATP. You’ll fill in this column by working backwards. Start with the first A-priority race of the season. At the intersection of the Period column and the first A-priority race row on your ATP write in “Race” in the Period column. Then go up one row and write in “Peak 2” and then up one more and again write in “Peak 2”. The next two periods vary based on your age or, more accurately, your capacity for recovery. If you are younger than 50 (or recover relatively quickly) count up four weeks and write in “Build 2” for each of these weeks. Then count up four weeks again and write in “Build 1.” Do the same for Base 3, Base 2, and Base 1. If you are older than 50 or recovery relatively slowly assign three weeks to each of these periods but include two Base 3 periods and two Build 2 periods. The reason for the age or recovery differential is that older athletes or those who recover slowly typically need more frequent rest weeks. The last four to seven days of each Base and Build period is a recovery week. Some athletes who recover quickly will be ready to start training at a higher level after only four days of active recovery. Others may need as many as seven. The top two to six weeks are labeled “Prep” regardless of age. How many of these you schedule depends on when the previous season ended and how ready you are to start focused training again. Finally, the week after your first A race write in “Tran”—short for transition to a new long-term training program. If this first Transition period comes early in your season then I’d suggest taking just a few days off from focused training. This may only be three days but could be seven depending on mental and physical fatigue or niggling injuries. After the last A race of the season you may need two to six weeks. The idea is to give not only your body but also your mind a break. It’s alright to “exercise,” but “training” is forbidden. The purpose is to rest and rejuvenate by not having a routine or workouts that must be done. The novice athlete does not do the Build periods so as to focus attention on the basic abilities for one or two seasons. In this case, Base 3 is repeated and replaces the Build periods. Planning up to the first A-priority race schedule of the season is now complete. It was the easy one. Basically, we just followed a formula to plan it. For the subsequent A races you have a decision to make and some periods to leave out. For example, when scheduling beyond the first A race you will not repeat the Prep period and probably not Base 1 or Base 2 either. However, you may want to return to Base 3 after the first Transition period if your basic abilities (Aerobic Endurance, Force or Speed Skill) have obviously declined in the last few weeks. This is not unusual when the first A race was a short event and the next is long. You may even want to do Base 3 twice, if there are enough weeks until the second A race. If your basic abilities, especially Aerobic Endurance, are lacking it will greatly detract from training and racing for the rest of the season. But if the basic abilities are still strong after the first A race then you may want to start back into training with a Build 1 or Build 2 period. A note of caution: Don’t short change the Base abilities in order to do more high-intensity training. Of course, at this point as you are planning the season you are guessing about what sort of fitness you’ll have several months from now. That’s another reason why the ATP is likely to change throughout the season. Finish filling in the “Period” column on the ATP through the end of the 2010 season. Later on, should you decide that the plan you have isn’t right, you can always make changes (I hope you’re doing the work with a pencil or electronically). I’ve never coached an athlete who made it all the way through a season with no ATP adjustments. I'm planning on using your virtual coach at TrainingPeaks. I'm a cyclist. 1. As I have it set up right now my first A race is 23 weeks into the program. The week after I have a B race. Should I switch those or is it ok to have a B race the week after an A race? Either way I'll be going back into base and build. 2. I have a B race scheduled for week 17. That falls on the first week of build 2. Is that ok? Joe, what is your advice if the first A race comes too early in the year to fully complete all periods to their prescribed durations? Ed--Sure. No problems on either. plum--Focus on what will do you the most good/give greatest race benefit the closer you get to the race. 1. 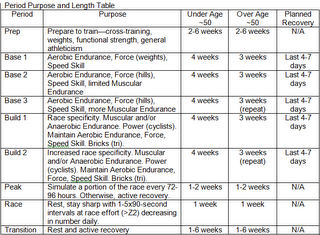 Do you find most age group triathletes are able to peak twice and have decent results. I struggled with it last year? 2. Are you finding athletes burning out who repeat base 3 several times because of its high volume? 3. After I read your admonitions on the transition period below, do you ever recommending extending it 2-3 months? jim--General question: Change one of your spring B races to an A race and peak for it. 1. Yes, no problem. Actually better that way than only 1 peak. 2. I haven't but then I never have anyone do this. But that is a possibility if you do it several times. 3. Seldom. But has happened. A woman I once coached for her first IM (she won AG and set course record) needed 6 months of "play" rather than training afterwards. Longest I've come across. Couple of questions I was wondering about. First one is pretty easy, what is the date for age group nationals? I have seen different dates all over the place, and don't know which one to believe. Second question is what is the best way to prepare for a race series that contains 6 races that go from June 6th to September 19th? Kinda torn if I want to just race this series, or if I want to take a shot at age group nationals, or even do both. Based on pervious years results I could win the series, but I would like to see where I would rank against the best in my age group. Justin--What's your sport? I don't have a list of nat championship races for either cycling or tri but I'm sure some kind reader can help once we know the sport. Your 6-race series spans about 14 weeks. Just be sure to prioritize them as suggested. Shouldn't be a problem unless you deicde to make most of them A races. Good luck! "The 2010 Age Group National Championship will be held in Tusclaoosa, AL on September 25th pending final approval within the next four weeks." -- the lastest from the usatriathlon website. I'm a 40 year old cyclist, and I'm currently in Build 1, with my primary bicycle racing season starting in April. I've got about 12 hours a week to train. I currently spend 3 hrs a week in the gym on weights. Historically, climbing has been a limiter for me. I was wondering if you think it is wise to spend time doing low cadence hill climbing (~50-60rpm) or if I would be better served spending that time on higher cadence hill climbing drills and let the gym take care of the strength and muscle/joint adaptations? Which way is more likely to lay the foundation for better climbing performance next season? Doug--What I do is have the rider do the MS phase in Base 1 and in Base 2 we do high gear/hill work. In Base 3 we begin shifting to higher cadnce climbing. Those who recover slowly or older than 50 should include two Base 3 and Build 2 periods BEFORE their first A-priority race? If so, their planned recovery for each period will tend more towards 4 or 7 days? Fabiano--Can't say. Depends on how quickly athlete recovers. Joe, could you elaborate on the kind of workouts and intensity one should be striving for during a Base 1/2 recovery week? Recovery in the later periods seems easier to quantify than these earlier periods of relatively low intensity. plum--Great question. I have the athletes I coach recover for about 4-5 days in a recovery 'week.' This generally involves a day off and 3-4 easy days meaning low intensity and duration relative to what they have been doing. How low these go depends on how hard the training has been coming into this period.